Inevitably, when you begin to make noise others will want in on the action. Opportunities will begin to come your way and you will be enticed by all sorts of interesting offers. When this happens, it is crucial that you don't succumb to what others want. There will be pressure and there will smooth talking......and there will be opportunities you pass on. But what is most critical is that you have a clear idea of what you want and that you never let someone elses enthusiasm or big idea get in the way of that. We all have the ability to become better, to improve. More often than not, my focus tends to be on exterior improvements; recording better songs, looking better, leveraging technology to my benefit, etc. But when it comes to building character there may be nothing as important as working on your innerself. Becoming more humble, tolerant, balanced, and honest comes primarily from consciously working on yourself. I came across this video on YZ, whose 1993 album 'The Ghetto's Been Good To Me' I used to play non stop. What I didn't know and didn't expect was that he has gone partially deaf. As a musician I am constantly exposed to loud music at venues and have made it a habit to always carry a pair of ear plugs with me. I can't stress it enough, but if you watch this short video you will not only to get a little piece of Hip-Hop history but also a first hand account of the importance of caring for your hearing. True Hip-Hop Stories: YZ . The live show is where the money is. If you can consistently have 50 people show up to your gigs, you are a regional force in your genre. If you can consistently pack in 100 people at each and every show you perform, you are a minor regional celebrity. At 250 people per show you have the option of being a fulltime national touring musician and are a full fledged regional celebrity. 500 people per show opens up all countries and territories as viable performance opportunities. 1000 people per show and you are a celebrity. Those numbers may seem small to some but I perform multiple times a week, they are the truth. We all get excited from time to time about brilliant ideas we have. But ideas from conception to fruition normally take alot longer than we initially expect. This is where patience comes in to play. When initially setting off on a new idea that you are excited about, I recommend taking a second to think about how much of your time and resources it's going to take, then double that number. If you are still passionate about it then set off on your journey. All the while keeping patience by your side. By doing this you will have significantly increased your chances of achieving your goal. Temperamento has been blowing up the underground Latino Hip-Hop scene for a few years now. 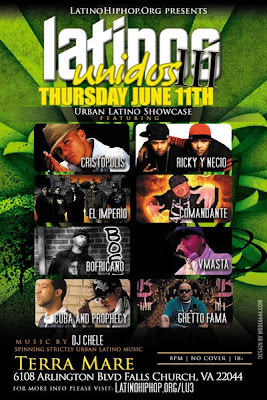 On this track he showcases his skills alongside fellow underground Latino Hip-Hop celebrities T-Weaponz. In years past I have placed ads promoting my music and events in the local city paper and in newspapers dedicated to the Latino demographic. In all honesty, you know that a print ad has had some sort of effect but you can't really calculate how many people it actually reached. With the ever increasing trend of everything going digital, Google Ads and similar online marketing look like the new kings of the hill. The ability to actually view how many impressions you are receiving, which key words are gaining you clicks and in what regions, make it very unlikely that I will be returning to print ad marketing. Google 'latino hip-hop' and see my ad. That ad is seen around the world something else the city paper could never provide. "Julito Marana" by Julio Voltio is one of my favorite tracks of all time. Here is the music video which is full of guest appearences including Fat Joe and Tego Calderon. 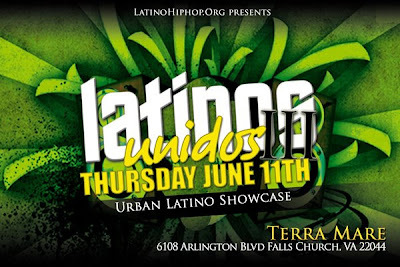 Latinos Unidos III will be on June 11, 2009 at Terra Mare. Terra Mare is located at 6108 Arlington Blvd., Falls Church, VA 22044. This event will be 18 and older and will have no cover charge. Sick Jacken took some time out between touring and promoting his new album Stray Bullets to answer a few questions for LatinoHiphop.Org. In awe of his longevity in the music business I focused on asking questions that may inspire and guide other fellow Latino Hip-Hop artist's. 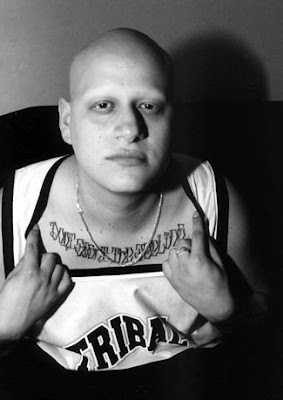 LatinoHiphop.Org: With over 15 years in the music business and 8 albums under your belt, what advice would you give to independent Latino Hip-Hop artist's just starting out? Sick Jacken: BE READY FOR A LONG, DIFFICULT ROAD OR GET A REGULAR JOB. WITH THE STATE OF THE BUSINESS RIGHT NOW, RECORD LABELS AREN'T HANDING OUT DEALS LIKE THEY USED TO. THEY'RE LOOKING FOR ARTISTS THAT HAVE SOMETHING GOING ON ALREADY. BUILD UP YOUR PROFILE BOTH ONLINE AND ON THE STREET, AND BRAND YOURSELF AS A COMPLETE PACKAGE. BE ORIGINAL. LatinoHiphop.Org: What is your creative process in putting together a song, from start to finish? Sick Jacken: I FIND A BEAT THAT MAKES MY BRAIN START GOING. ONCE THE CONCEPT IS THERE, I TRY TO FIND AN OPENING LINE THAT FITS BEST. ONCE I FIND THAT FIRST LINE, THE REST JUST FLOWS OUT. I ALWAYS LOOK FOR NEW RHYME PATTERNS AND MELODIES SO THAT IT DOESN'T SOUND THE SAME AS THE LAST SONG. LatinoHiphop.Org: What 1 or 2 major changes do you see happening in the music industry within the next 5 years? Sick Jacken: I SEE RECORD LABELS EITHER BEING OBSOLETE OR SURVIVING BY TAKING MORE FROM THE ARTIST THAN THEY DID BEFORE. I THINK THE BIG TOUR PROMOTERS WILL BE THE NEW HUB FOR ARTISTS, ALL THEY NEED TO MAKE THAT HAPPEN IS TO OFFER DISTRIBUTION. BECAUSE "SELLING OUT" DOESN'T GUARANTEE BIG MONEY ANYMORE, I THINK MUSIC WILL GO BACK TO BEING ORIGINAL AND CREATIVE. Seth Godin is one of the worlds greatest marketers. I have written about him in the past and draw great inspiration from his books and blog. Below is a talk he gave at TED in which he breaks down the importance of 'Tribes'. What is so fascinating to me about this talk is that he is talking directly to us. Latino Hip-Hop is a tribe. We are a deep and rich niche within the greater Hip-Hop culture and as he explains in this video, that's a wonderful place to be. What is the difference between 'Reggaeton' and 'Latino Hip-Hop'? There is definitely a sound that can easily be recognized as Reggaeton, namely rapping or singing over a den bow style track. But the sound is changing by increasingly fusing elements of dance, electronica and pop. To add to the confusion, all of the heavy hitters; Daddy Yankee, Tego Calderon, and Don Omar have many songs that are, what would be considered 'Latino Hip-Hop'. Is Reggaeton just another way to say Latino Hip-Hop? What if you never made it big? If you never hit a homerun with your music, what would your life be like? I'm talking about the average you, the one that continues to work hard but never gets a big break. If that were to happen could you live with the choices you've made? How does it make you feel when someone commends you on a job well done? For most of us it feels quite good. It's nice when hardwork is recognized, and when you make it a point to always recognize it in others you improve your relationship with them. And business is all about relationships. As an entertainer it feels truly great when you perform to a packed venue. There's nothing like a great crowd to truly inspire an artist to perform their heart out for you. But what about the shows when there are only a few people there? Perform your heart out anyways! If you can walk away from every show you perform, with one new fan, it is a success. Just one addition to your mailing list, one person talking about you to someone else can at times be worth more than a packed venue if no one there were to remember your name afterwards. When you look at a car or a building, what makes it standout? When you listen to a live band or order some food at a restaurant, what makes it standout? What makes things better than others in the same category? Kaizen is a Japenese concept defined as a relentless striving for perfection through continuous incremental improvement. How can Latino Hip-Hop artists apply this concept to their careers? I think the most effective way is by finding a few achievable short term goals, that always seem to get put off till later. Then focusing on just one of them until it's completed. After completing a task, feel good about it, celebrate in your own little way. Then do it again with a new task. This technique of relentless incremental improvement is the backbone of many success stories, why not make it part of yours?